The medieval “petite citie de caracture” of Josselin sits in the North of the department of Morbihan with the Nantes Brest canal running through the heart of this town. 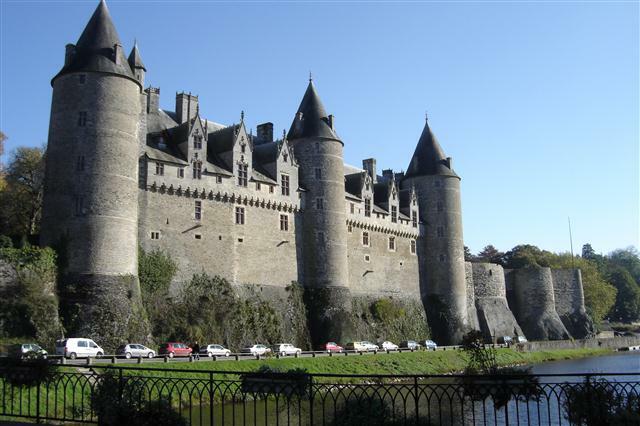 One of the most spectacular sites is the Chateau de Josselin on the banks of the Canal. Part of the chateau and its grounds are open to visitors, with tours in French and English. The chateau is now classed as a monument historique. Being first built in the 11th century and has been rebuilt several times. During the French Revolution, part of it became a prison. The chateau is still used as a residence today. Every other year the town holds it Festival Medieval where visitors are encouraged to dress in costume and enjoy the ambiance. Saturday is market day in Josselin with the stalls lining the streets with half timbered buildings and in the summer months becomes very popular with tourists. Many enjoy a leasurley stroll around the stalls and then a stop off in one of the many bars and restaurants. Those living in Josselin are known as Josselinais.. Josselin was founded in the 11th century by the Viscount of Porhoet. In the centre of the village is the Basilica and cloaked around the square are an assortment of bars and restaurants making Josselin a real tourist magnet.